Spring is slowly coming to Finland, and our thoughts are turning to flowers, Spring, and oh yes, EASTER! This is the season of rebirth, of freshness, and for many of reflection. It's time put alway the drab old clothes and step out in beautiful new colors and accessories. We have a new member to our team that really understands what we all love at this time of year. 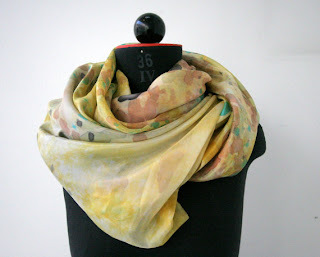 Anna Matilainen paints her generously large silk scarves with the prettiest spring colors. Though she has custom knit cowls and scarves, it is her silk scarves that seem to satisfy the need for brightness the most. Anna's lovely scarves need pretty earrings to set them off, and Marina from Marina's Wishes has several delightful choices. 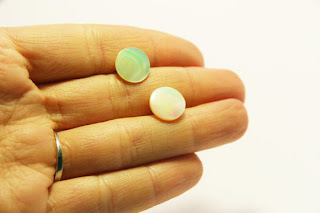 These lovely iridescent white mother of pearl earrings will go with so many spring outfits without being a distraction. Not only are they gorgeous, but they are also free of nickel,lead, mercury and cadmium. This is also the season to muse or sketch. 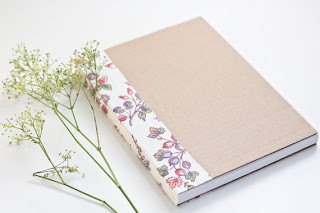 Sasha Kretova from Paper Plane Stationery has made a sweet floral book from 100% recycled materials and then hand-bound this book with a vintage floral fabric along the spine. What a perfect place to write your spring memories or even press flowers! It's a perfect size for your creative needs and yet still fits into a medium-sized bag. 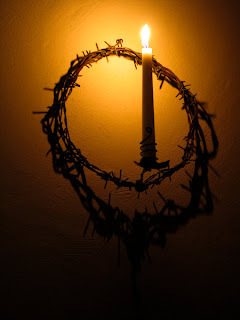 Elina Mäntylä of ValonaDesign has a whole different perspective on Easter and has crafted this unique and powerful Crown of Thorns candle holder. Her listing tells the story, "I came up with the idea of crown of thorns -candle holder years ago when I first got interested in rusty barbed wire at my grandparents farm. It shocked me to realize that something that strong came out in my hands so lightly. This happened on Easter time. I felt that I understood little more of the Easter because of the process. It seems that by creating things I sometimes get more understanding." While there is a deeply religious meaning to this candle holder, there is also a wonderful rustic air. It would be as much at home gracing your Easter dining room walls as it would in any casual western-themed room anywhere. These are but a few of the spring and Easter items available from the Finland Handcrafters Team. We are a growing group of over 100 artisans based in Finland. Drop by and visit, shop, and enjoy!